After thirteen years working with LifeSpan, our beloved Emilie Ratterman has retired. Along with spending time with her children, grandchildren, and other family members, she hopes to get a good start on the things she has not had time to finish. People fall every day. We fall behind. We fall apart. We, literally and figuratively, fall on our faces. 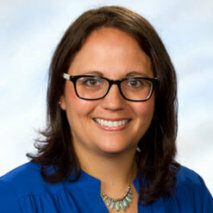 When asked how Emilie Ratterman, Intake & Referral Specialist, found herself working with older adults, she simply said, “I fell into it.” Maybe it wasn’t just coincidence, but perhaps geriatric social work stuck out its foot and purposely tripped her, as it knew that the elderly population needed her. And for the past thirty years, through trial and error, Emilie has found her footing, and stands both firm and committed to the clients she serves. Regardless of who is on the other end of the line, through her knowledge and calming spirit, Emilie helps the person prioritize their needs and most importantly assures them that they are not alone in their current circumstances. She will also continue giving to the community through volunteering, specifically with OSHIIP, an organization Emilie has been involved for twenty plus years; “almost as long as they have been around”. 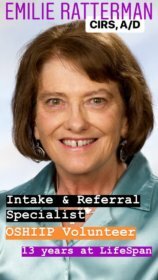 And we may find her tucked into the Intake and Referral corner helping with some organization and the updating of community resources. Emilie fell into this field, and over time, LifeSpan staff and clients fell, too. They fell in love with her. Emilie’s insight, passion, and commitment is a testimony to the thousands of lives she has touched. We thank her for her contributions to LifeSpan and hope everything will continue to fall into place in her life.